Of equal importance, Camran on a personal level has positively affected many of us as well. His sincerity, clarity of thought, and faith that the future can be made better than the present—if only we apply ourselves to the unsolved problems of medicine—remain a source of continual inspiration. I recall vividly the experience of Camran inspiring me to strive for broader frontiers, when, at the 2nd European Congress in Gynecological Endoscopy in Heidelberg, Germany, a packed audience sat transfixed on uncomfortably hard folding chairs as he unveiled his uncannily prescient vision for the field of laparoscopy, foretelling of a time years into the future when large incisions would eventually become obsolete. This was in 1993, ten years ahead of the curve, when operative laparoscopy was still considered quite limited and dangerous, especially since the technology did not exist to match this futuristic view. As with so many pioneers in our profession, Camran indeed attracted numerous negative reviews, in the category of “medical heresy.”7 Yet today, we see that his early commitment to advancing medicine has helped pave the way for laparoscopic specialists the world over to provide patients with the option of speedier recoveries and improved outcomes. That day in Heidelberg, I was enthralled and felt challenged by him to participate more fully in expanding the frontiers to help with his vision. So where did such a man come from? Camran was born in Iran (Persia). His interest in medicine started very early and became his desire when his mother became ill and required a great deal of medical care. The doctors involved in her care saved her life. After this incident, Camran’s father praised the doctors as saviors of their mother. The Nezhat brothers therefore grew up with the knowledge that doctors were highly valued in their family and in the world for their life-saving services. This fueled the desire in the Nezhat brothers to enter medicine. On reflection, because of the significant role that Mrs Nezhat had in the life of her children and because of her steadfast devotion, 3 of the Nezhat brothers did in fact became gynecological surgeons. During internship and residency at the State University of New York, under the tutelage of Dr Ronald Batt, Camran was exposed to laparoscopy as a diagnostic tool for infertility patients and for those suffering from pelvic pain. During those days, laparotomies were performed even for mild endometriosis. After observing so much postoperative distress suffered by laparotomy patients compared with patients who had diagnostic laparoscopy, Camran thought to himself, “Why shouldn’t we treat more surgical pathologies laparoscopically?” The hindrance to expanding from diagnostic to operative laparoscopy, it seemed to him, was not a question of anatomical or physical constraints, but rather was a question of conceptualizing new technologies and methodologies. He learned that other investigators around the world, aware of this potential, were trying to expand the application of laparoscopy. Visualization difficulties from peering crouched over through the endoscope with only one eye seemed the most crucial impediment to overcome. Thus, in recognizing this need and inspired by the earlier pioneers’ work, this crucial moment of realization led to a turning point for operative laparoscopy as Camran embarked on refining laparoscopic procedures to assist both patients and the operating team to achieve greater results. 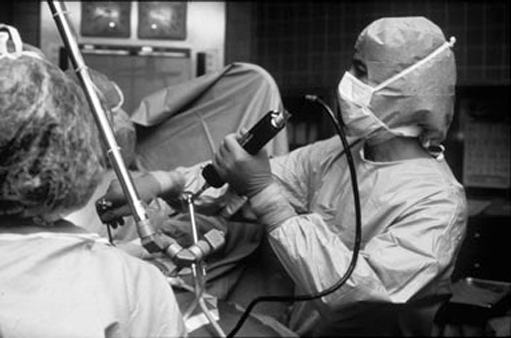 At the forefront and important juncture of the discovery of the advantages of operating on the images (videolaparoscopy), Camran performed endoscopic surgery off the monitor starting in the late 1970s, using very heavy and awkward video camera equipment that had been produced for other uses and which instead he customized— rigged actually—for use with the laparoscope1–6. Camran Nezhat, MD, performs endoscopic surgery off the monitor. Operating directly from the visual field utilizing only the monitor transformed the operating room from a “one man band” into an “orchestra,” so that assisting surgeons, nurses, anesthesiologists, students, and others could fully view and therefore more readily assist in and learn the surgery. After residency, Dr Harold Feldman, one of Camran’s professors at that time, recommended him for a fellowship in reproductive endocrinology and infertility under the mentorship of Drs Robert Greenblatt, Don Gambrell, and Virenda Mahesh, PhD, in Augusta, Georgia, who were themselves leaders in reproductive endocrinology and immunology. During this time especially, he confirmed his interest in helping couples suffering from infertility as he saw their overwhelming joy in experiencing parenthood after successful treatment. He was also motivated to assist those women suffering from other debilitating reproductive disorders. Following this fellowship in 1980, he started his own infertility practice in Atlanta. It was at this time that Camran was able to concentrate more fully on improving and expanding the use of the videolaparoscopy technique and designing new instrumentation. Soon he became one of the most skilled surgeons. Word of mouth began to spread of this approach and soon his practice began to thrive. Patients started arriving from all over the country and abroad. Camran has always shared his experiences with his colleagues around the world and has continued to present his methods, results, and his experiences at different medical societies and congresses to explain the benefits of this technique. Camran is fortunate to have the support of his family. All of his brothers, including a psychologist, an industrial engineer, and 2 physicians, have encouraged and inspired him. His mother, who passed on 5 years ago, also joined them in Atlanta and was an especially significant source of inspiration. Their father had passed on earlier. Farr and Ceana later joined Camran in his practice. As they were being recruited by different universities in different parts of the country to teach their techniques, Stanford University Medical Center was the winner! Ms Linda Meier chairman of the board at Stanford Medical Center and Kenneth Bloom, CEO of the Stanford Medical Center at that time, and Claire Mailhot traveled to Atlanta to convince Camran and his brothers to move to Palo Alto and start teaching and sharing their experience with persons in other surgical disciplines for the purpose of proliferation of endoscopic surgery and teaching future generations of surgeons. Upon arriving at Stanford, they did collaborate with physicians in different surgical disciplines and propelled Stanford University to the forefront of endoscopic surgery. In fact, in September 1993, Stanford was one of the few universities to embrace endoscopic surgery. The chairman of surgery at that time was Dr John Niederhauber, an open-minded surgeon, specializing in oncological surgery. After seeing Camran demonstrate the new techniques in the operating room, Dr Niederhauber became a true convert and subsequently collaborated with Camran and other colleagues to perform many general surgical procedures laparoscopically. Shortly thereafter, Dr Niederhauber honored Camran with a clinical professorship in the Department of Surgery at Stanford. Thus, as a result of these initial leaps of faith and in collaboration with those in different disciplines of surgery, endoscopic surgery at Stanford bound forward. Camran is testament to the fact that being a pioneer is often a very lonely place until our beliefs are tested and proven. It took 20 years, but we are grateful that Camran preserved and held steadfast to his dreams. Camran has been sharing his experiences by teaching postgraduate courses in advanced laparoscopy and hysteroscopy since September 1983, and thousands of physicians have been exposed to his teachings. He especially enjoys being a mentor to young physicians and scientists, who inspire him immensely with their optimism and enthusiasm. Today, Camran continues to contribute to the Art and Science of Surgery. He is the immediate past president and sits on the Board of Trustees of the Society of Laparoendoscopic Surgeons, is the Director of the Center for Special Minimally Invasive Surgery, and is Clinical Professor of Surgery and OB/GYN at Stanford University School of Medicine. He has published more than 500 articles, book chapters, abstracts, letters to the editor, and video presentations. He is coauthor of 2 textbooks and has won numerous awards and honors from prestigious societies like ACOG, ACS, ASRM, and the Excel Award from the Society of Laparoendoscopic Surgeons. More recent awards include the ACOG 2004, ASRM 2004, and ACOG 2005. He is on the editorial board of the Journal of Fertility and Sterility and is an associate editor for the Journal of Society of Laparoendoscopic Surgeons. And yet, one of the fondest memories is my image of him walking with his brothers on a crowded New York City street, so much just the older brother providing love and support to his family. He has expanded that familial bond to many who have become part of his laparoscopic family through our work with him, especially in that extended family known as the Society of Laparoendoscopic Surgeons. I have to this day on my desk a picture of Paul Wetter, Camran Nezhat, Farr Nezhat, and Ceana Nezhat standing with me in front of the JSLS display to remind me of the collegiality, the honor, and the challenge of being a caring physician in the spirit of our SLS family. He has challenged all of us to do better for our patients, and we gratefully accept that challenge. I would like to thank Farr and Ceana Nezhat for sharing family memories and especially to Camran Nezhat for opening his heart for this article. 1. Nezhat C. Laser laparoscopy for the treatment of endometriosis. Paper presented at: Conjoint Meeting of the American Society for Reproductive Medicine and the Canadian Fertility and Andrology Society; 1985; Toronto, Canada. 34. Nezhat C, Siegler A, Nezhat F, Nezhat C, Metzger D, Luciano A. Complications. In: Operative Gynecologic Laparoscopy Principles and Techniques. New York, NY: McGraw-Hill; 1995; 287: 310. 35. Nezhat C, Siegler A, Nezhat F, Nezhat C, Seidman D, Luciano A. Complications. In: Operative Gynecologic Laparoscopy Principles and Techniques. 2nd ed. New York, NY: McGraw-Hill; 2000; 365: 390. 36. Nezhat C, Nezhat FR, Nezhat CH, Admon D. Endometriosis of the intestine and genitourinary tract. In: Nezhat CR, editor. ed. Endometriosis: Advanced Management and Surgical Techniques. Springer-Verlag; 1995. 37. Nezhat C, Berger GS, Nezhat FR, Buttram VC, Nezhat C. eds. Operative laparoscopy: preventing and managing complications. In: Nezhat CR, editor. ed. Endometriosis: Advanced Management and Surgical Techniques. Springer-Verlag; 1995. 41. Stanford News Services Media Monitor. Stanford Report. February 9, 2005; 9.